Emerging market economies are heading for an economic implosion. From South America to South Asia conditions are deteriorating rapidly and heading for an even more severe economic crisis in which many are already mired. At the head of this list is Brazil and Argentina. Others increasingly fragile, however, include Turkey, Indonesia, Malaysia, and even India, which has covered up its weak economic condition, and massive non-performing bank loan problem, by manipulating its GDP to falsely exaggerate its growth rate. Business pundits, and even some commentators on the ‘left’, argue that emerging market economies, of which all the above are key members, now account for more than half of the world’s GDP. This suggests their vulnerability to US and G7 economies is less than it has been in the past. The so-called advanced economies–i.e. the USA, Japan, Canada, UK, France, Germany, Italy (the ‘G7–are increasingly irrelevant. But global GDP numbers are manipulated everywhere to show a stronger growth than actually has been occurring. Overnight, economies like India double their GDP numbers by redefining categories that compose their Gross Domestic Product, GDP, by manipulating price estimations that boost real GDP and by introducing statistical assumptions in their estimation of growth that are gross misrepresentations. GDP is thus not a good indicator of the condition of their economies. Even so, global GDP itself is now slowing this past year, as global trade also slows (even before USA precipitated ‘trade wars’ take effect). But this idea of declining vulnerability of economies like Brazil and Argentina is incorrect. GDP numbers obscure the still significant vulnerability of emerging market economies (EMEs) to the advanced economies and their policy actions, especially the USA. This is true for even the largest EME’s like Brazil, Argentina, Turkey, Indonesia, India and others. More symptomatic economic indicators of the growing crisis in EMEs are their currency declines, money capital outflows, rising domestic interest rates, and rising import cost inflation. While the EME’s share of global GDP has risen in recent decades, the world economy is nevertheless still largely manipulated by the USA and other G7 economies. That manipulation is exercised by the USA in particular by several means: through its dominant currency, the US dollar; by control of the flow of much of global credit (and debt) by US banks and US shadow banks through capital markets; and by the influence of the US central bank, the Federal Reserve, over US interest rates and, in turn, rates by other central banks and banks elsewhere. Recessions and crises in the EMEs are largely the consequence of USA policy shifts involving US interest rates, US dollar appreciation or depreciation, global crude oil price speculation that follow the dollar, or lending by US banks and US shadow banks (i.e. investment banks, hedge funds, private equity firms, etc.,) in what are called ‘capital (corporate debt) markets’ that function as alternative sources of credit from traditional bank loans. In 2017 all these US policy levers began to shift to the disadvantage of emerging markets. That shift is accelerating in 2018. The result has been ‘made in the USA’ deepening recessions in the EMEs, collapse of their currencies, capital outflow from EMEs back to the USA and G7, accelerating EME domestic inflation, and increasing political unrest and instability. Therefore, not GDP, but a more telling initial indicator of the growing fragility in emerging economies is the recent freefall of their currencies in relation to the US dollar, Euros, and Japanese Yen, as well as the capital flight from these countries that occurs in tandem with the collapse of their currencies. These in turn become the key drivers of EME domestic recession, mass unemployment, inflation, goods shortages, and growing political instability. And at the head of the list of economies with currency instability today in South America are Brazil, Argentina, and Venezuela. But the same process is emerging rapidly elsewhere in the EMEs, in Turkey, Indonesia. Malaysia, and perhaps next even India. But no region of the global economy more strongly reflects the crisis today than Brazil and Argentina. Argentina’s currency, the Peso, has fallen around 25% since the beginning of 2018. Turkey, Brazil and others are also falling at double digit rates in recent months. With the collapse of their currency, the value of investments held by capitalists in these countries–foreign and domestic alike–also fall in value. To protect the value of investors’ assets from collapsing with their currency (i.e. stocks, bonds, real estate, foreign currency holdings, derivatives, etc.) their governments (legislatures and central banks) respond by raising interest rates in their own economies, in the desperate attempt to stem the capital outflow set off by currency collapse. Investors’ investment values are propped up by raising domestic interest rates. But the the contradiction is that higher interest rates depress the real economy, throwing it into recession; or if recession already exists, into yet deeper recession and even depression. But investors don’t care about recession; they care foremost about protecting the value of their investments. Thus the pro-business, pro-investor EME governments opt for higher rates and accept mass unemployment as a cost. EME currency collapse has another economic consequence. Since most of these countries import much of their basic goods (food, medical supplies, oil, raw materials for manufacturing, consumer goods, etc. ), the collapsing currencies also raise inflation on these goods due to rising import costs. Thus stagnating and then declining real economy and mass unemployment is accompanied by rising prices. More workers are laid off because of the slowing economy, while the prices they must pay for basic goods and services simultaneously rise as well. Argentina and Brazil are especially exposed to this scenario of US rising interest rates and dollar that precipitates collapse of their currencies, capital flight, rate hikes, mass unemployment and inflation. Since the 2008 global crash they have borrowed heavily–especially in US dollars. The massive trillions of dollars of debt they accumulated since 2008 must be repaid in dollars. To get dollars they must export and sell more goods. But the slowing of global trade and other developments in China, Europe and China has reduced their ability to export more. They can’t raise sufficient dollars with which to pay their US dollar denominated debt (to US banks and shadow banks). In order to continue to pay their foreign debt principal and interest coming due (to US and G7 bankers) they are forced to borrow dollars from the International Monetary Fund, IMF–another key economic institution controlled by the US and G7. Argentina recently borrowed another $50 billion from the IMF–to pay its debt to USA and G7 bankers. However, this doesn’t solve its problem. It only shifts debt payments from private bankers to the the IMF. The IMF never ‘bails out’ countries; it always bails out bankers that have loaned to these countries when the latter cannot make payments to their bankers (and bond investors, etc.). 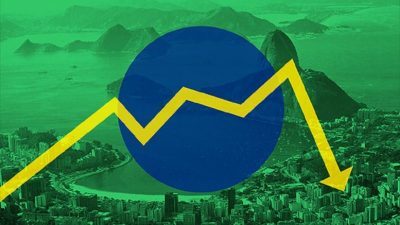 While Argentina has turned to the IMF to temporarily buy time as its crisis deepens, Brazil has gone another route to deal with its ‘made in the USA’ crisis that has been ripening since 2015. It has borrowed even more from US bankers. And it has chosen to raise its interest rates to astronomical levels, in the vain hope of propping up the value of its currency will stem its capital outflow (and encourage continuing capital inflow to Brazil from USA and G7 investors as well). Brazil’s central bank interest rate is currently around 40%–up from around 14% just a few years ago. That means businesses or consumers have to pay 40% on any loan or debt their incur to stay in business or maintain consumption levels. Interest rates that high virtually shut down wide areas of an economy. And that’s what’s been happening in Brazil. Mass unemployment has followed. As has accelerating inflation and cost of living as Brazil’s currency, the Real, has collapsed in relation to the dollar. Understandably, political unrest follows as jobless grows and prices for basic goods accelerate. That too is now underway. Brazil’s crisis began in 2015. At that time its central bank interest rates were, as noted, around 14%. Since 2015 they have risen to the 40%. More than half of that acceleration has occurred in just the past year, and especially in 2018. But those 40% rates, and the unemployment and inflation, are the result currency collapse and capital flight–which in turn is a process that has its origins in the USA and rising US interest rates and dollar appreciation. The error of the Brazilian Workers Party while still in government, led by Lula and then Rouseff, was to allow Brazil’s central bank to steadily raise interest rates since 2015 to current levels. Central banks are always controlled by the private bankers. And private bankers in EMEs like Brazil are dominated by US bankers and investors. And EME central bankers are in turn controlled by their domestic banking interests. Furthermore, capitalists everywhere have cleverly engineered their central bank institutions to ensure the central banks are shielded from popular national legislatures, just in case popular democratic movements (like the Workers Party) democratically assume power over national governments. Political power remains shielded from economic power. Capitalists have many ways to sabotage democratically elected governments. Central bank interest rates are but one tool. The Workers Party in Brazil should therefore have democratized (nationalized in the public interest and fundamentally restructured) the Brazilian central bank back in 2015-16, by opening its decision making process to include democratic forces and representatives. (For my view of how central banks can, and must, be democratized see the concluding chapter to my book, ‘Central Bankers at the End of Their Ropes’, Clarity Press, 2017). In Argentina, the Kirchner government for years refused to repay the US hedge funds their billions of dollars in claims from the earlier debt crisis engineered by them. What it should have done was to pay the hedge funds in special issued and printed Argentine pesos, instead of dollars, and told them to get lost, they’ve been paid. Instead it fought them in global courts dominated by the US and G7. As the Brazilian economy began to weaken after 2016, and conditions worsen, the USA, allied with domestic Brazil capitalists and pro-Business politicians in Brazil, developed a political strategy to accompany the US interest rate-dollar policies designed to undermine Brazil’s currency and destabilize its economy. This was the so-called ‘political corruption’ offensive, engineered in the USA and implemented in coordination with Brazilian business interests and pro-business political parties. By painting Workers Party leaders–Rouseff and then Lula himself–as corrupt, they drove them from office (or in the case of Lula jailed him to prevent him from running). An unapologetic pro-Business/pro-USA Temer government was put in place. A similar ‘political’ strategy was implemented against the Kirchner government in Argentina, to drive it from office and replace it with the current pro-business Macri government. Temer in Brazil and Macri in Argentina are mirror images of the USA-G7 economic-political strategy to remove populist governments in South America and replace them with pro-USA, pro investor governments. Destroy the currency is always at the forefront of USA imperialist strategy to drive out populist, democratic governments and re-install pro-Business, pro-US investor governments. USA policy toward Venezuela today is not dissimilar, and represents an extreme version of what has been rolled out in Brazil and Argentina. The USA embarked several years ago to destroy Venezuela’s currency, shut off access to US dollars with which to purchase needed food, medical and other imports, while launching another version of ‘government leaders are corrupt’ political-public opinion offensive. It has supported and financed domestic political opposition forces and parties to the Maduro government. Now it is talking about the final extreme alternative of military intervention. It is lining up other right wing governments in Latin America to take the lead in intervention if necessary. But the USA will plan, direct and finance the costs of military intervention using its proxies, if it comes to that. Recent elections in Venezuela that returned the Maduro government to office have signaled to Washington that the Brazil-Argentina strategy might not work in Venezuela. Thus the consideration of more direct military intervention is now on Washington’s agenda. Trump has as much as said so publicly. But the USA’s strategies of economic destabilization by, initially, raising interest rates to generate capital flight and currency collapse, to have central banks escalate domestic interest rates in the countries to precipitate mass unemployment and recession, to cause accelerating import goods inflation of critical items–and to engage in ‘leaders are corrupt’ political offensives to depose democratically elected popular governments–may not prove successful in the longer term. Already democratic movements, unions, strike actions, mass demonstrations are emerging in Brazil and Argentina. And Venezuela holds out despite the desperate destruction of its economy by USA-business interests. Elections are set soon in Brazil. The results will be critical. What the USA-Temer government’s next moves might be are critical. How Brazil goes, so too will go Argentina, giving rise to further popular demonstrations and strikes should elections in Brazil throw out the Temer government. And should both countries restore democratic governments, USA policy toward direct intervention in Venezuela will stall temporarily. But whatever the political outcomes, the more fundamental economic forces will still prevail: South American popular governments must find a way to prevent their central banks from acting ‘independently’ on behalf of pro-business, pro-US investors, interests; they must find a way to stabilize their currencies not based on the US dollar; and they must not fall into the debt trap offered by the IMF. Until these levers of US-G7 economic power and hegemony are eliminated, emerging market economics like Brazil, Argentina and Venezuela will always be susceptible and at the mercy of USA economic hegemony. This article was originally published on Jack Rasmus’s Website. Jack Rasmus is author of the recently published ‘Central Bankers at the End of Their Ropes: Monetary Policy and the Coming Depression’, Clarity Press, August 2017; ‘Looting Greece: A New Financial Imperialism Emerges’, Clarity Press, October 2016; and ‘Systemic Fragility in the Global Economy’, Clarity Press, January 2016. His website is: http://www.kyklosproductions.com and twitter handle, @drjackrasmus. He is a frequent contributor to Global Research. Thank you!You are most welcome!